Pomfret Gallery01977 795009work Shop - Arts & CraftPomfret Gallery is a family run business started in 1987 by Chris & Linda Pennock and have been joined by their son Richard since 2010. They specialise in picture framing, quality printing, photography and have 2 floors of original art on display. The framing and printing departments are allocated on the ground floor and offer a high class service with a fantastic range of mouldings and mounts. Anything can be framed including needlework, sports shirts, medals and any other 3-D items. All the work is carried out by the experienced staff in the workshop on the premises. 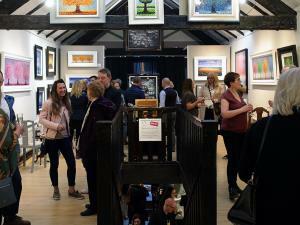 The first floor houses the light and spacious gallery that sells original art by leading artists and art and photographic images by owner Chris Pennock. The high quality photographic images feature many local landscapes plus images from further afield. There is always a friendly welcome at Pomfret Gallery and with easy access from the M62 & A1 and their own private car park it is well worth a visit. Pomfret Gallery is a family run business started in 1987 by Chris & Linda Pennock and have been joined by their son Richard since 2010.